Objective: To investigate the role of Wnt/β-catenin signaling pathway on migration ability in Asthmatic Rat Airway Smooth Muscle Cells (ASMCs). Methods: The asthmatic rat airway smooth muscle cells were cultured in vitro. The expression of Wnt/β- catenin in ASMCs was detected by RT-PCR and Western blot. 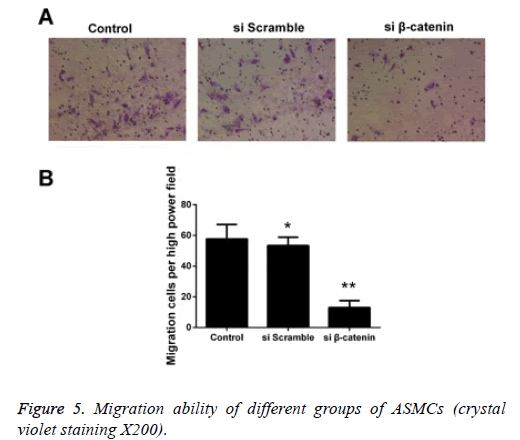 Migration ability of ASMCs was detected by wound healing assay and Transwell migration assay. Results: Compared with normal rats, the expression level of Wnt/β-catenin in chronic asthmatic rats ASMCs was obvious higher. Knockdown of Wnt/β-catenin signaling pathway by specific siRNA was able to decreases the migration ability of ASMCs. Conclusion: The migration ability of ASMCs of chronic asthma rats’ increases, and Wnt/β-catenin signaling pathway may participants in this event. Wnt/β-catenin, Asthma, Asthmatic rat airway smooth muscle cells, Migration. In addition to the functions of airway contraction and proliferation, Airway Smooth Muscle Cells (ASMCs) are also served as the origins for multiple inflammatory mediators and active ingredients in extracellular matrix, with which ASMCs can mediate the chronic inflammation in asthmatic airway and induce the Airway Hyperresponsiveness (AHR); thus, ASMCs play a very important role in the occurrence and development of bronchial asthma . Recent studies have shown that the migration capability of ASMCs may be significant for the occurrence and development of airway remodeling [2-4]. Previous studies have indicated that ASMCs that can be converted into myofibroblasts through migration participate in the airway remodeling . Nevertheless, the mechanism of intracellular signal regulation in migration of ASMCs remains unclear yet. Wnt signal pathway is one of the important intracellular signal transduction pathways, in which β-catenin, as a key regulatory factor, participates in the genetic transcription in association with the embryonic development; β-catenin, except it’s extremely important role in intercellular adhesion, can also regulate the cell migration [6,7]. Previous studies revealed that β-catenin is involved in various pathophysiological processes, such as the chronic inflammation in asthmatic airway, AHR and proliferation of ASMCs [8,9]. However, there remains no literature reporting the roles of Wnt/β-catenin signal pathway in the variations of ASMCs migration capability in chronic asthma models. In this study, through establishing the chronic asthmatic model of rats, we aim to investigate the variations of ASMCs migration capability in asthmatic status and the roles of Wnt/β-catenin signal pathway in this process, thus providing the experimental evidence for further illustrating the mechanisms of pathogenesis and development of asthmatic airway remodeling. Ovalbumin (OVA) and collagenase-I were purchased from Sigma (USA); DMEM culture medium was purchased from Hyclone (USA); fetal bovine serum (FBS) was purchased from Zhejiang Tianhang Biotechnology Co., Ltd.; primers and normalized substances for nucleic acid molecular weight in Polymerase Chain Reaction (PCR) were purchased from Takara (Dalian, China); polyclonal rabbit anti-human β-catenin antibody was purchased from Cell Signaling Technology Co., Ltd; β-actin antibody was purchased from Santa Cruz; protein marker in moderate molecular weight was purchased from Thermo Fisher; Enhanced Chemiluminescent (ECL) kit was purchased from Millipore; lysis buffer for Radio- Immunoprecipitation Assay (RIPA) and Bicinchoninic Acid (BCA) protein quantitative kit were purchased from Beyotime Biotechnology Institute; 24-well Transwell chambers (8 μm) were purchased from Corning Costar. A total of 20 SPF healthy, male, Wistar rats were purchased from Slac Laboratory Animal (Shanghai) Co., Ltd(Animal use approval number: No.42005400000631). All rats were in the age between 4 and 6 w, and the weight range between 200 and 250 g.
Healthy, male, Wistar rats were used to prepare the chronic asthma models according to previous method , and the blank control group was also established. According to the random number table, we selected a total of 10 rats, and those rats received intraperitoneal injections of 1.5 ml OVA/Al(OH)3 mixtures (including 1 mg OVA and 100 mg Al(OH)3 respectively on at the 1st and 8th d. During the stimulation period, inhalation of atomized 1% OVA saline was performed for 30 min once every other day from the 15th d for a total of 60 d, and thereafter, chronic asthma models were successfully established for the culture of ASMCs in asthma rats. Remaining 10 rats were enrolled into the control group, and treatment was similar to the asthma group except that the OVA were replaced by normal saline at the periods of sensitization and stimulation. Rats in all groups were executed at 2 h after the last time of stimulation, and thoracotomy was performed after the serum samples were collected. After the bronchoalveolar lavage was performed for the right lung, the Bronchoalveolar Lavage Fluid (BALF) was collected, while the tissues in left lung were excised and collected for pathological detection. According to the culture method of Zhang et al. , after being anesthetized via intraperitoneal injection of 25% urethane (4 ml/kg), rats received thoracotomy rapidly, and lung was transferred into the D-hank’s solution in ice bath; lobar bronchus was carefully isolated under an anatomic microscope, and the single-layer airway smooth muscle that was scraped from the endothelium with the outer membrane of bronchus being fully dissected was cut into small pieces (1 mm × 1 mm) in a bottle containing penicillin; collagenase-I at 1 g/L was added into the bottle followed by digestion for 1 h in an incubator (37°C and 5% CO2), in which Dulbecco's Modified Eagle Media (DMEM) culture medium was added, well mixed, and filtered using a metal mesh; filtrate was then collected into an Eppendorf tube for centrifugation at 1000 r/min for 6 min, and the supernatant was discarded; cells in sediment was then re-suspended using the DMEM culture solution containing 20% FBS, 100 U/ml penicillin and 100 U/ml streptomycin, and then inoculated into a culture bottle for adhesive growth. Cell fusion was observed after 7 to 10 d of primary cell growth followed by digestion using 0.25% trypsin for subculture; medium was exchanged once every 3 to 4 d, and cell passage was performed after cells were fully spread on the bottom surface at 4 to 5 d; cells in the 3rd to 8th generations were applied in the experiment. After morphological observation and α-actin fluorescence immunostaining for identification, there were over 97% of α-actin positive ASMCs. ASMCs in logarithmic phase were inoculated onto a 6-well plate for 24 h of culture, and were transfected by β-catenin siRNA plasmid and empty vector using LipofectamineTM2000. Thereafter, cells were divided into 3 groups: ASMCs group (control), empty vector group and β- catenin downregulation group (ASMCs transfected by β- catenin siRNA). Primer sequences of ERK1 2: upstream sequence 5’- CTCAAGCCTTCCAACCTC-3’, and downstream sequence 5’- TTCCACGGCACCTTATTT-3’; 380 bp. Primer sequences of GAPDH: upstream sequence 5’- TGAACGGGAAGCTCACTGG-3’, and downstream sequence 5’- TCCACCACCCTGTTGCTGTA-3’; 307 bp. PCR reaction conditions were set as follows: 94°C for 2 min for initial denaturation; 94°C for 20 s for denaturation, 56°C for 1 min for annealing, 72°C for 30 s for extension for a total of 32 cycles; extension at 72°C for 5 min. Amplified products were preserved at 4°C. Statistical analysis was carried out for results of RT-PCR apparatus. After the cells adhering to the wall were treated and washed using pre-heated PBS, they were transferred into the Eppendorf tubes for centrifugation at 12000 rpm for 5 min, and the supernatant was abandoned. Cells collected from the sediment were lysed using RIPA, and the supernatant was preserved at -20°C. BCA method was used to determine the total protein concentration. 1/4 volume 5X protein buffer was mixed with protein supernatant and heated for 10 min at 95°C, then the samples were stored in the freezer at -20°C. Samples were then loaded for coagulation of protein via electrophoresis at 80 V, and under 100 V, proteins were separated and transferred onto the membrane followed by blocking using 5% skimmed milk for 1 h. Thereafter, polyclonal rabbit anti-human β-catenin (1:1000) and polyclonal rabbit anti-human β-actin were added onto the membrane at 4°C for incubation overnight, and then the membrane was washed using Tris-Buffer Saline and Tween 20 (TBST) on a decoloring shaker for 3 times (5 min/time). Horseradish peroxidase-labeled goat anti-rabbit IgG was added onto the membrane for 1 h of incubation at room temperature, and the membrane was rinsed using TBST for 3 times (5 min/ time). ECL reagent was then added followed by 1 min of reaction at room temperature, and exposure under X-ray, image fixation and color development were sequentially carried out. AMSCs in the logarithmic phase were starved using serum-free Roswell Park Memorial Institute 1640 (RPMI 1640) culture medium for 24 h, and then digested using 0.25% Ethylene Diamine Tetraacetie Acid (EDTA) trypsin. Thereafter, singlecell suspension was prepared using the ASMCs in serum-free RPMI culture medium, in which cell density was adjusted to 3 × 105/ml and cell vitality was above 95% via trypan blue staining. In the upper chamber of each Transwell, 200 μL serum-free cell suspension was added, and at the same time, drugs were given according to the grouping procedure. For each group with drug administration, 3 replicative wells were established. In the lower chamber of each Transwell, DMEM containing 10% FBS was added (600 μL/well). Then, plate was placed into an incubator for 24 h of incubation. Chambers were then taken out and rinsed using PBS twice to remove the culture medium. Wet cotton swabs were used to remove cells failed to pass into the upper chamber, and those cells were fixed in methanol for 20 min and dried at room temperature. Furthermore, crystal violet was used for 20 min of staining. Thereafter, under the inverted microscope, cells passed through the membrane were counted in central, upper, lower, right and left visions (400X), and average was then calculated. All values were presented as mean ± standard deviation. In statistical analysis, we performed the one-way Analysis of Variance (ANOVA) using Statistical Product and Service Solutions (SPSS) 21.0. Tukey's HSD (honestly significant difference) test is used in conjunction with an ANOVA to find means that are significantly different from each other. p<0.05 suggested that the difference had statistical significance. Under the light microscope, epithelial structure in bronchus of rats in the control group was integral without any significant inflammatory responses and the morphology of lung tissues was regular; for rats in the asthma group, epithelial detachment would be seen in bronchus, severe infiltration of inflammatory cells was observed surrounding the bronchus wall and vascular wall, mainly the lymphocytes and eosinophilic granulocyte, and smooth muscle layer was significantly thickened with stenosis in lumen (Figure 1). Figure 1: Pathological change of bronchioles in lung of chronic asthmatic rats (HE staining). Control group (A) and asthma group (B). Under the inverted microscope, primary ASMCs extracted from the bronchial tissues of asthmatic rat models were in long fusiform or cambiform with long processes at two ends; close to the center of cytoplasm, the oval-shaped cell nuclei were in density interaction and the growth state possessed characteristics of peak and valley. The results of α-actin immunocytochemistry fluorescence staining showed that 97% of cells had positive responses toα-actin, suggesting that the cells were smooth muscle cells (Figure 2). Figure 2: Identification of cultured airway smooth muscle cells. Compared with the control group, the mRNA and protein expressions of β-catenin in ASMCs in asthmatic model group were significantly increased and the difference had statistical significance (p<0.05) (Figure 3). Figure 3: The mRNA and protein expression level of β-catenin. ASMCs that were transfected using siβ-catenin were selected as the siβ-catenin group. Compared with the control group (cells received no treatment) and the empty vector group, i.e. 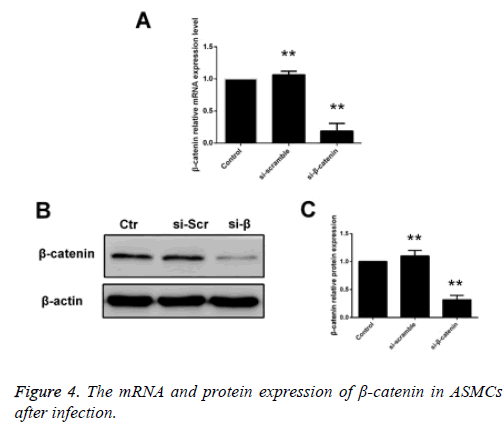 the si-control group, the mRNA and protein expression levels of β-catenin in the siβ-catenin were significantly decreased with statistically significant differences (p<0.05) (Figure 4). Figure 4: Relationship between serum iron and ascorbic acid in pregnant women in the 1st trimester. We detected the effect ofβ-catenin siRNA on the migration capability of ASMCs via Transwell experiment, and the results showed that the quantity of cells that were transfected using β- catenin si RNA and successfully passed through the membrane was significantly less than that in the β-catenin si-control group and control group. The statistical analysis on cell count revealed that there was a statistically significant difference in comparison of quantity of cells that passed through the membrane between the β-catenin siRNA group and control group (p<0.05), while no statistically significant difference was detected between the β-catenin si-control group and control group (Figure 5). Figure 5: Migration ability of different groups of ASMCs (crystal violet staining X200). As a kind of non-specific chronic inflammatory airway disease caused by the common effect exerted by multiple inflammatory cells, inflammatory mediators and cytokines, bronchial asthma can result in not only the recurrent onset of airway inflammation, but also the remodeling of airway [11,12]. With the disease progression in asthma, gradual alterations in airway structure will give rise to the continuous bronchial hyperresponsiveness, which is closely correlated with the severity of asthma and prognosis of treatment, finally leading to the irreversible stenosis in airway. However, ASMCs is critical to the occurrence and development in airway remodeling [13,14]. Research has shown that ASMCs, through obtaining the relatively strong migration capability, are involved in the airway remodeling [10,15,16]. Vascular Smooth Muscle Cells (VSMCs), with relatively strong migration capability, can migrate from the medial membrane directionally to the subendothelial membrane, thus participating in the pathogenesis of vascular remodeling, and occurrence and development of various diseases, such as atherosclerosis. Therefore, we inferred whether ASMCs, with the characteristics similar to VSMCs, have the migration capability, through which ASMCs can exert its functions in airway remodeling. In addition, some scholars found the myofibroblasts in the lamina propria of airway in the asthma patients, which were quite similar to ASMCs in microstructure, morphology and position. This phenomenon further suggested whether the myofibroblasts in the lamina propria of airway is transformed by the migrated ASMCs . However, there remain few studies reporting the migration capability and specific regulation mechanism of ASMCs. 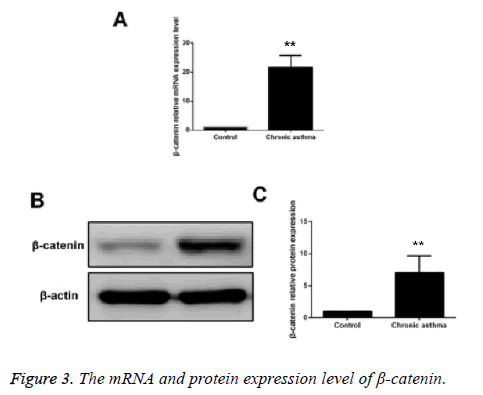 β-catenin, a kind of multifunctional protein in cells, can be served as the core regulatory protein in Wnt signaling pathway to participate in the regulation of intercellular adhesion. Under the normal circumstances, the combination between β-catenin in cytoplasm and E-cadherin on the cell membrane can promote the intercellular adhesion, during which the free β- catenin in cytoplasm sustains in a low level, and can hardly get into the nucleus to activate the downstream target genes. When Wnt signaling pathway is activated by the stimulations posed by various factors to cells, Wnt ligand will bind with the Frizzled/LRP receptor on the cell membrane, and the phosphorylated products will activate the downstream molecule, Dsh, further isolating the β-catenin from APC/Ax-in/ GSK-3β compounds. Consecutively accumulated free β- catenin will enter the nucleus to bind with the TCF/LEF compounds, which can activate the transcription of downstream target genes, thereby regulating a series of biological events, such as cell proliferation, apoptosis, movement and differentiation . Recent studies have shown that hyperresponsiveness in airway and hyperplasia in airway smooth muscle can be reduced in the chronic asthmatic rat model through specifically blocking this pathway using β- catenin si-RNA . Additionally, β-catenin is critical to the generation of extracellular matrix of ASMCs induced by TGF- β1, and, thus, it can interfere the generation of extracellular matrix . All these results revealed that Wnt/β-catenin signaling pathway is involved in the remodeling process of bronchial asthma airway . Moreover, some studies have confirmed that the activated β-catenin can induce the epithelial-mesenchymal transition and promote the repair process in airway, thus being involved in the airway remodeling . However, there remains no literature reporting the regulation mechanism of Wnt/β-catenin signaling pathway in migration capability of ASMCs. In this study, we established the chronic asthmatic rat model to extract the ASMCs for primary culture, and adopted RT-PCR and Western blotting to detect the expression levels of β- catenin in ASMCs in the control group and the asthmatic model group. Results of this study showed that compared with the ASMCs in the control group, mRNA and protein expressions of β-catenin in ASMCs in the asthmatic model group were significantly elevated, suggesting that Wnt/β- catenin signaling pathway is abnormally activated in the ASMCs of rats in the chronic asthmatic rats, and it may be involved in the occurrence and development of asthma. To further explore whether the alterations in migration capability of ASMCs are correlated with Wnt/β-catenin signaling pathway, siRNA was used to specifically suppress the activity of Wnt/β-catenin signaling pathway. And we found that compared with the control group and the siRNA-transfected empty vector group, the mRNA and protein expression levels of β-catenin in the siRNA β-catenin group were obviously decreased, indicating that Wnt/β-catenin signaling pathway is effectively blocked. Transwell migration experiment proved that β-catenin that was excessively silenced could significantly inhibit the migration capability of ASMCs, suggesting that the abnormally activated β-catenin could enhance the migration capability of ASMCs. In conclusion, it is found that the migration capability of ASMCs in the chronic asthmatic rat models is significantly enhanced compared with the control group, and the abnormal activation of Wnt/β-catenin signaling pathway is closely correlated with the increase in the migration capability of cells, which will deepen our understandings on the pathogenesis of asthma. Therefore, to figure out the role and relevant regulation mechanism of Wnt/β-catenin signaling pathway in the occurrence and development of airway remodeling in chronic asthma, and block Wnt/β-catenin signaling pathway to decrease the migration of ASMCs can provide new ideas and evidence for prophylaxis and molecular targeting treatment of chronic asthma in clinical practice, which possesses extensive clinical significance and promising application prospect. Hirota JA, Nguyen TT, Schaafsma D. Airway smooth muscle in asthma: phenotype plasticity and function. Pulmonary Pharmacol Ther 2009; 22: 370-378. Wei B, Shang YX, Li M. Cytoskeleton changes of airway smooth muscle cells in juvenile rats with airway remodeling in asthma and the RhoA/ROCK signaling pathway mechanism. Genet Mol Res 2014; 13: 559-569. Ding MJ, Wang LX, Dai YR. Changes of airway smooth muscle cell apoptosis in asthmatic airway remodeling and the effect of dexamethasone in rats. Chinese J Tubercul Resp Dis 2008; 31: 607-610. Wei B, Liu YL, Zhang C. Effects of NK-1R inhibitor WIN62577 on the migration of airway smooth muscle cells in asthmatic rats with airway remodeling. Zhongguo Dang Dai Er Ke Za Zhi Chinese J Contemp Pediatr 2015; 17: 1248-1252. Gerthoffer WT. Migration of airway smooth muscle cells. Proc Am Thorac Soc 2008; 5: 97-105. Yao H, Ashihara E, Maekawa T. Targeting the Wnt/beta-catenin signaling pathway in human cancers. Exp Opinion Ther Targets 2011; 15: 873-887. Behari J. The Wnt/beta-catenin signaling pathway in liver biology and disease. Exp Rev Gastroenterol Hepatol 2010; 4: 745-756. Yeganeh B, Mukherjee S, Moir L M. Novel non-canonical TGF-beta signaling networks: emerging roles in airway smooth muscle phenotype and function. Pulmonary Pharmacol Ther 2013; 26: 50-63. Kumawat K, Koopmans T, Gosens R. Beta-catenin as a regulator and therapeutic target for asthmatic airway remodeling. Exp Opinion Ther Targets 2014; 18: 1023-1034. Zhang XY, Ma LJ, Guo YL. Effect of BCYRN1 on proliferation and migration of airway smooth muscle cells in rat model of asthma. Zhonghua Yi Xue Za Zhi 2016; 96: 3751-3756. Izuhara K, Matsumoto H, Ohta S. Recent developments regarding periostin in bronchial asthma. Int J Jap Soc Allergol 2015; 64: 3-10. Balmasova IP, Sepiashvili RI, Sepiashvili IAR. Bronchial asthma pathogenesis and genetic prognosis development. Zhurnal Mikrobiol Epidemiol Immunobiol 2014; 3: 60-67. Wan X, Zhao J, Xie J. Effects of mitochondrial ATP-sensitive K+ channel on protein kinase C pathway and airway smooth muscle cell proliferation in asthma. J Huazhong Univ Sci Technolog Med Sci 2012; 32: 480-484. Perry MM, Baker JE, Gibeon DS. Airway smooth muscle hyperproliferation is regulated by microRNA-221 in severe asthma. Am J Respir Cell Mol Biol 2014; 50: 7-17. Su HY, Mo BW, Wei JH. Effect of TLR4 on the migration of asthmatic airway smooth muscle cells induced by airway epithelial cells. Chinese J Appl Physiol 2012; 28: 103-106. Li LH, Lu B, Wu HK. Apigenin inhibits TGF-beta1-induced proliferation and migration of airway smooth muscle cells. Int J Clin Exp Pathol 2015; 8: 12557-12563. Sabatino L, Pancione M, Votino C. Emerging role of the beta-catenin-PPARgamma axis in the pathogenesis of colorectal cancer. World J Gastroenterol 2014; 20: 7137-7151. Kwak HJ, Park DW, Seo JY. The Wnt/beta-catenin signaling pathway regulates the development of airway remodeling in patients with asthma. Exp Mol Med 2015; 47: 198. Baarsma HA, Menzen MH, Halayko AJ. beta-Catenin signaling is required for TGF-beta1-induced extracellular matrix production by airway smooth muscle cells. Am J Physiol Lung Cell Mol Physiol 2011; 301: 956-965. Moheimani F, Roth HM, Cross J. Disruption of beta-catenin/CBP signaling inhibits human airway epithelial-mesenchymal transition and repair. Int J Biochem Cell Biol 2015; 68: 59-69.